RainSaucer - Why are rain barrels 55 gallons? 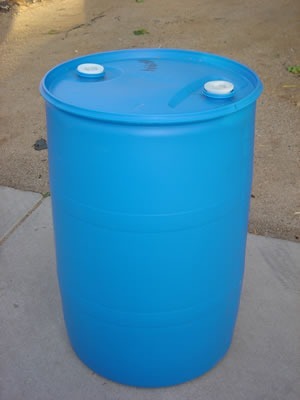 Why are rain barrels 55 gallons? 55 gallons just seems like an odd number to size a rain barrel. But not when you think of it in metrics when that 55 gallons becomes 200 liters. But still, you have to wonder- why 200 liters? Apparently its the international standard for drums (aka barrels) and it goes all the way back to World War II. The metric loving yet industrious Axis powers started making the drums out of steel as a way of tranposrting fuel and other liquid supplies. The drum's size, shape, and weight distribution lent itself to being moved about readily on the loading dock or factory floor with a two-wheeled hand truck. The drums could also be turned on their side and rolled or even moved by hand short distances on firm surfaces by tilting and then rolling along the base. Soon after the Axis powers starting using the drums, the Allies adopted the same measurements and thus the US 200 liter (55 gallon) drum industry was born. Over time, steel drums were joined by plastic and the top-side holes bung holes were standardized to US pipe measurements. On a side note, the oil industry never adopted the drum standard. A barrel of oil is based on the 42 US gallons (35 imp gal; 159 L) whiskey barrels of the 1870s.